Groups are the best way to easily add and manage your departments. For example, say you have 5 salespeople and a front desk person, and the salespeople need access that the front desk person does not need. You could set the salespeople up as a single group and give them all the same level of access at once. Add Group - This button will create a new group. Delete Group - This button will erase the selected group only if all users have been removed from that group first. Set Default Group - This button allows you to make the selected group into the default group. The default group is the group any newly-added user is set to. 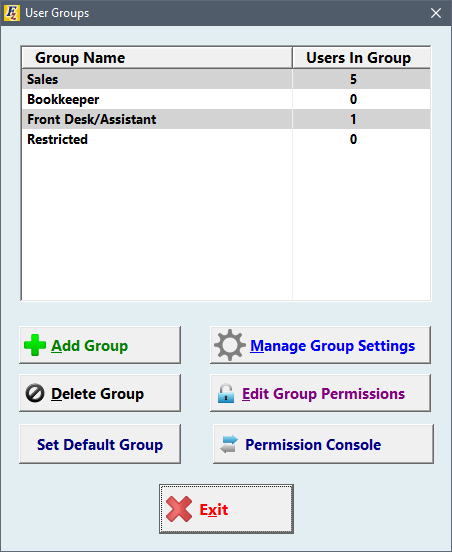 Manage Group Settings - This button allows you to do several things with the selected group, such as adding/removing users from the group, editing the permissions in each group, and manage the permissions of each user in that group. Edit Group Permissions- This button allows you to edit all the permissions for the selected group. Permission Console - Use this button to transfer permissions between two users, groups, or either/or.